I think it must be, but that does not help resolve the issue I have now bumped up against a couple of times. 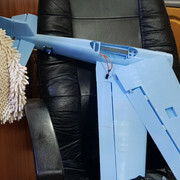 Most recently I fancied building a 3D printed plane, and yes I know it will be stupid hours run and likely fall apart, but hey, a man's got to do, etc. And I have again tripped over the same matter as with some other files. I have asked the owner of the model and await a reply, but the issue I have (and with other models) is that the designer does not give detail on infill settings. This one is stated as most parts 0,25 layer high, canopy 0,1mm. But no mention of infill other than for one part at 50%. If all of it was 50% it would too heavy to lift off! Someone has said that they failed to print OK as the slicing failed to give the right pattern infill, and the designer thinks it is a Slic3r issue. No further detail on exactly what though. I have downloaded the latest Cura but both it and Slic3r default to 20% infill, so its not specifically a Slic3r issue. 1. How can you tell what infill % or pattern to set if you are not told, is it buried to see in the .stl somewhere? 2. If the guy uses Cura, and states use 0,25 layer height, which I assume is 0.25mm, why does Cura step from 0.2 to 0.3, as does Slic3r, with no 0.25 to choose? The guy has come back quickly bless 'im, but only part answered. He says he uses Simplify3D. Great, $150, I think not! He says all except Fus 1 and motor mount are hollow no infill (logical, I'd got that! ), but the rest have only one perimeter. Can't see how that would possibly be strong enough for a wing, and his distant photos of a finished transparent material model show what looks like diagonal infill at a very big spacing/low percent, countering what he's saying. (Poss language barrier). He says that those that do have infill are 50%. Fus1 is quite a robust box and I'm doubtful that 50% would add usable strength over say 20%, just weight? The actual motor mount I'd have thought better as 100%? personally, after long hours of designing, testing and re-designing (repeat several dozen times ), I doubt there's a 3d printed wing design out their that can stand-up to heavy stress maneuvers for anything like a extended amount of time and even less that can stand-up to a less than gentle landing.